In August 2011, London Organizing Committee for the Olympic Games (LOCOG) announced a £7million sponsorship deal with Dow Chemicals. 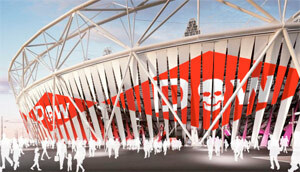 The deal will see Dow Chemicals provide a branded wrap for the London 2012 Olympic Stadium in Stratford, East London. On the surface the sponsorship seems innocuous, just another money making venture between the Olympics and a multi-national, keeping entirely in the spirit of modern day Olympics. Although the original spirit of the Olympics is something to celebrate, the modern day incarnation has seen several suspect sponsors – does it make sense for a fizzy drink company (Coca Cola) or a fast food chain (McDonalds) to sponsor a sporting event celebrating fitness and athletics? No. Neither does it make sense for a nuclear company (EDF) or an oil company (BP) to be sustainability partners of the games that has the ambition to be the most sustainable to date (probably not a hard task to achieve). Despite this, choosing Dow Chemicals, perpetrator of the world’s worst industrial disaster (which sits up there with Chernobyl), as an Olympic sponsor is an illogical and senseless move. As an Indian, I am always astonished how little people in the West, outside of human rights and environmental circles, know about The Bhopal Gas Tragedy. Everyone knows about Chernobyl, which happened in the 80s too. What’s even more distressing is that victims of The Bhopal Gas Tragedy continue to be born to this day yet an out of sight tragedy remains largely out of the minds of ordinary Western folks. So for the uninitiated, this is the story of Bhopal and Dow. On the night of 2nd and 3rd December 1984, an enormous cloud containing 27 tons of the deadly gas methyl isocyanate, 500 times more toxic than cyanide, filled the air. The origin of the death cloud was a pesticide factory belonging to Union Carbide Corporation (now wholly owned by Dow Chemicals). That night thousands died and in the next 27 years and counting, thousands more would suffer from chronic diseases and thousands would be born with severe deformities. According to Union Carbide the official number of deaths is at 3,800 although Bhopalis who cleaned the streets of bodies contest that 15,000 died that night with at least 8,000 more deaths occurring during the following week. To date, Bhopal Medical Appeal, a UK charity that runs the only clinic that provides free health care in Bhopal reckons at least 25,000 people have died and at least 120,000 still suffer from health issues such as blindness, respiratory and reproductive disorders. There is a second, lesser-known disaster in Bhopal, also attributed to the fatal Union Carbide factory. As early as 1972, Union Carbide had been warned that the groundwater was being contaminated due to chemicals leaking from the factory. Nothing was done about this. After the gas explosion, the factory closed in 1984 but Union Carbide did not remove the lethal pesticides, which have continued to leak into the soil and water. An investigation in 2002 revealed lead, mercury organochlorines in the breastmilk of nursing mothers. So, where is the situation at now? Union Carbide simply abandoned the factory in Bhopal and never cleaned up the site. To this date, the site has never been remediated and Bhopal has the dubious distinction of being labelled a ‘global toxic hotspot’ by Greenpeace and the Indian Centre for Science & Environment. In 1989, a quick settlement was botched between Union Carbide and the Indian Government. Rumour has it the US government forced the Indian Government to accept this settlement or to face losing foreign direct investment. Activists are trying to reopen the case in India as the 1989 settlement did not take into account the full extent of the damage. Warren Anderson, then CEO of Union Carbide, is listed as an absconder in an Indian Court but the US Government refuses to comply with the Indian Government’s request for extradition. When the matter was brought to LOCOG and Seb Coe’s attention, campaigners were simply given Dow Chemical’s PR spiel: Dow Chemicals did not own Union Carbide at the time of the disaster and only bought the company in 2001. Hence Dow Chemicals is not responsible for Bhopal. Then who is? Union Carbide? But Dow is Union Carbide! Under basic corporate law, when a company buys another company, that company inherits the previous companies assets as well as liabilities. Even Dow Chemicals knows this – Dow paid off an outstanding lawsuit against Union Carbide soon after acquiring the company, settling with former UCC asbestos workers in Texas for $2.2 billion. Of course, this settlement was in America, where the legal system, is arguably more robust than the Indian legal system. Essentially Dow Chemicals think because the disaster happened in a poor developing country, there is no need to face the consequences. And so the tragedy continues. The money that should be put to cleaning up Bhopal’s soil and ground water, laying pipes to bring in clean drinking water, and to providing free lifelong health care is instead being used to provide a superfluous wrap for the London 2012 stadium. London doesn’t need a wrap to host the games successfully. Surely, Dow Chemical’s blood money taints the games and London’s Olympic legacy. As an Indian and a Londoner I am disappointed I cannot celebrate the Olympics when it comes to my city.